Brussels is known for historic sites, museums, sightseeing, childrens museums, and nightlife. Your plan includes some of its best attractions: contemplate the long history of Grand Place, find something for the whole family at Mini-Europe, examine the collection at Royal Museums of Fine Arts of Belgium, and make a trip to Les Galeries Royales Saint-Hubert. For where to stay, other places to visit, maps, and other tourist information, you can read our Brussels vacation builder. Singapore, Singapore to Brussels is an approximately 21.5-hour flight. The time zone difference when traveling from Singapore to Brussels is minus 7 hours. Traveling from Singapore in July, expect nights in Brussels to be cooler, around 16°C, while days are little chillier, around 26°C. Cap off your sightseeing on the 16th (Sun) early enough to go by car to Bruges. Bruges is known for historic sites, sightseeing, museums, nightlife, and breweries. Your plan includes some of its best attractions: contemplate the long history of Historic Centre of Brugge, pause for some serene contemplation at Onze Lieve Vrouwekerk, make a trip to The Markt, and enjoy breathtaking views from Belfry of Bruges. 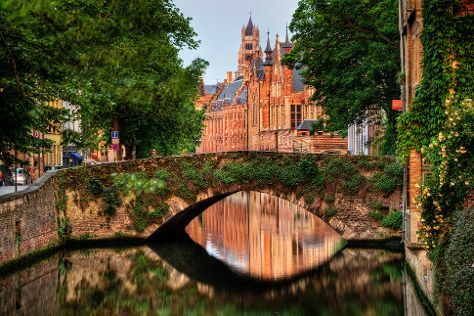 To find where to stay, traveler tips, ratings, and tourist information, read our Bruges tour planner. Drive from Brussels to Bruges in 1.5 hours. Alternatively, you can take a train. In July, plan for daily highs up to 24°C, and evening lows to 15°C. Finish up your sightseeing early on the 18th (Tue) so you can travel back home.